An ESPN.com story shows the Cowboys owner flailing to address concerns about NFL players protesting during the national anthem. It’s Houston Texans owner Bob McNair’s comment on NFL players’ protests of police brutality during the national anthem, that “we can’t have the inmates running the prison,” getting most of the attention in this ESPN.com piece today on behind-the-scenes league meetings about the issue. But the real star of the story is Cowboys owner Jerry Jones, forcing himself into the center of the debate, as always. THE NIGHT BEFORE that meeting, Jerry Jones stood in a suite at Yankee Stadium, watching the Yankees play the Houston Astros in the ALCS but also, perhaps, catching a terrifying glimpse into his future. The Cowboys are what the Yankees once were: America’s most iconic team in America’s most iconic — and patriotic — sport. Jones was a man at the pinnacle of his profession that chilly night, the Hall of Fame owner whose power among his peers is drawn from a relentless skill at growing the NFL’s total revenues and the guile to outmuscle everyone. But those who have spoken with him sense a dull panic, as if so much of what the NFL has built — what he has built since buying the Cowboys in 1989 — is eroding. Jones and his fellow owners had arrived in New York that day like heads of state, setting up shop at the Four Seasons and in their own apartments with a clear agenda: Stop Trump from attacking our business. Find a way to persuade players to stop kneeling. Get the focus back to football. In it, we see a 75-year-old man fearful that the empire he created, his legacy, is entering a decline. Jones, with all his killer business instincts and carny gifts, can’t bluster his way through this one. Jones delivers a “reckoning” to his fellow billionaire team owners, pushing for a league-wide mandate on decorum during the national anthem. He doesn’t get the support he wants. Now, suddenly, Jones found himself in an unfamiliar position: He wasn’t getting his way. He knew it, and everyone knew it. Like the numerous reasons behind the protests, the business concerns were nuanced — one major sponsor had threatened to pull out if the NFL were to issue a mandate to stand. 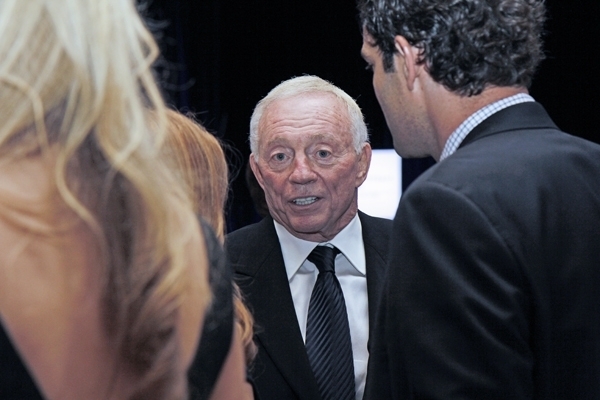 Jones, the consummate businessman, is now immersed in social and political issues that could affect the Cowboys’ bottom line. He can no longer stick to sports. And it’s not clear Jones knows how to reckon with that reality. The whole story is worth a read.